First Legion is very pleased to present our latest sub-range to our WWII The Arms and Armies of the Second World War Series, the Battle of the Bulge!!! That’s right, we are turning our talents towards “Hitler’s Gamble”, the massive, but ultimately doomed, German offensive designed to split the Allied Armies and force them to the negotiating table. Like our Stalingrad, Normandy, and DAK sub- ranges, it will be a full series featuring a wide variety of figures and vehicles from several nationalities. 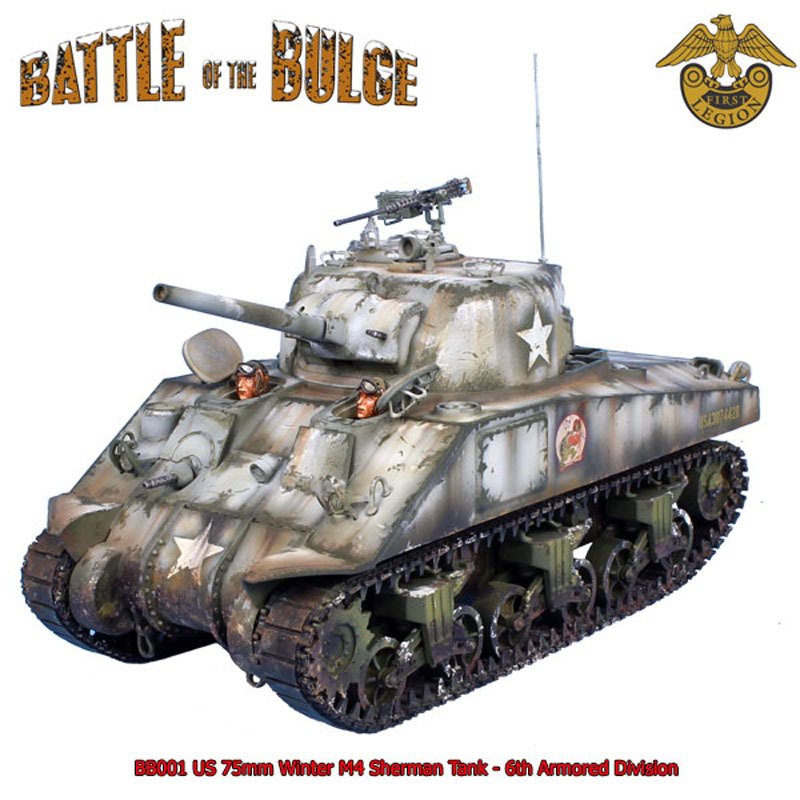 We are launching the series with set BB001 US 75mm M4 Sherman Tank from the 6th Armored Division. The “Super” 6th Armored was heavily engaged in the US counterattack at Bastogne. We have presented it here with 2 x 1/4 crew figures for the opening/closing hatches and given it a spectacular “winter” camo painting scheme, taken to a new level to any winter tank that we have done previously. With the “Fighting Turtle” insignia emblazoned on its side hull, this is a wonderfully detailed tank to kick off what we hope to be a spectacular series of the figures. Enjoy!